SNES Super Demo World: The Legend Continues (any v1.1) "warps" in 18:19.45 by bahamete & Dawn. This hack of Super Mario World contains a Star World which contains themed levels that connect to various locations on the map. Like the original Super Mario World, these levels can be used as a makeshift warp zone. 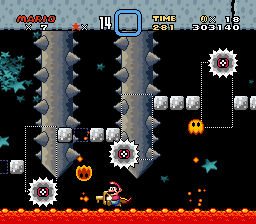 This movie demonstrates this path - navigating the Star World to charge straight to Bowser, leaving much of the game untouched. This movie is 3.56 seconds shorter than the previous movie as a result of many small optimizations throughout the run, as well as a few big ones. See the authors' comments for more details. The homepage for Super Demo World, including the patch to be used on a Super Mario World ROM image, and the program used to make the hack, is available online. If you want to see more of this hack, check out the 120-exit run.